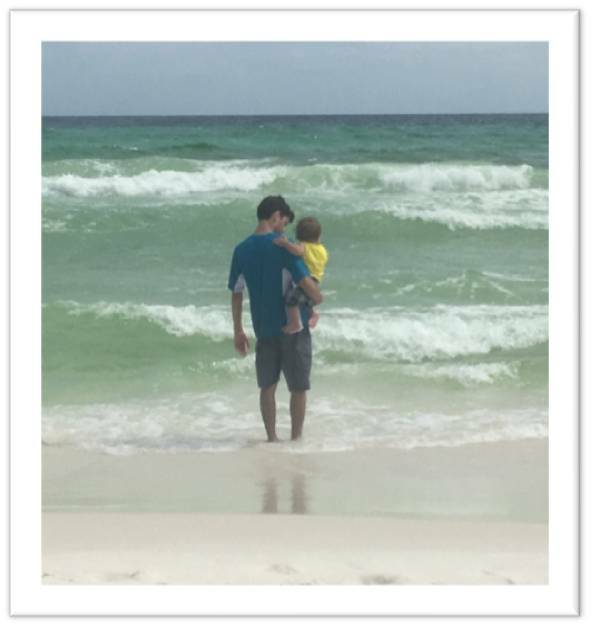 I love the beach, but I had never been with a baby or young toddler! So when we were given the opportunity to travel to my favorite beach destination with my parents I was both elated and a bit worried. The best part of the beach is sitting with my feet in the sand, a good book in my hand, and just listening to the waves….ALL DAY. I wasn’t sure how taking an 11-month old would fit into my serene picture of tranquility! That doesn’t even get me to the concerns about the days spent on the beach! Am I driving you nuts yet? 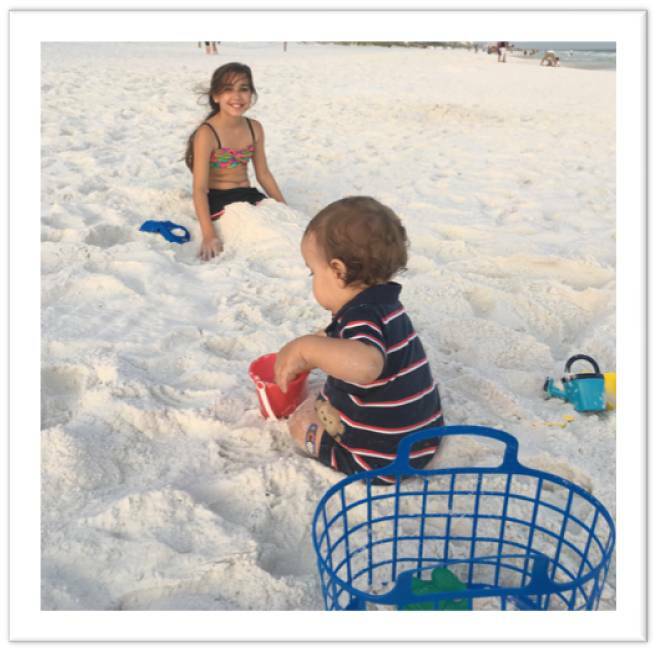 But I knew…some babies/toddlers LOVE the sand, and some don’t. 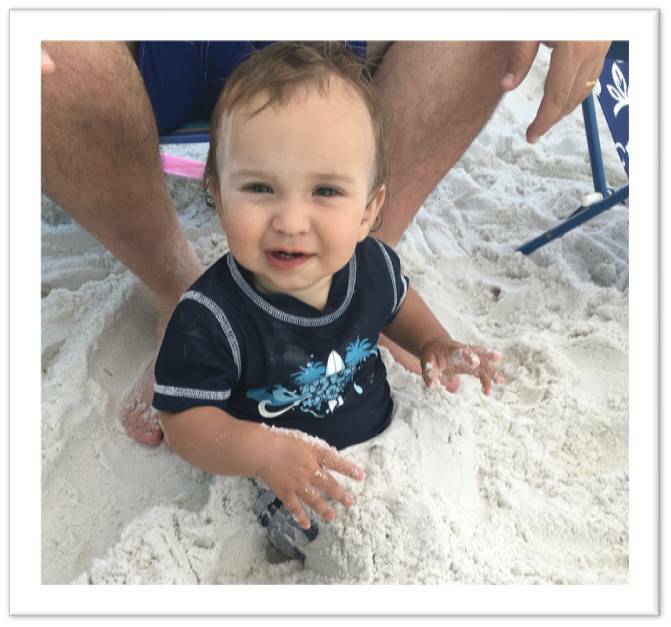 My son had never been in sand, so I just wasn’t sure. Plus, would he just want to make a bee-line to the water? Or be content to play next to me? Whew… needless to say, I spent sometime researching. Then I made some plans to use the ideas I thought might work and off we went. And you know what? WE HAD A BLAST! Gabe LOVED the sand, the water, the beach, everything. My older kids had more fun than they thought they would too! So… here’s a collection of what worked and what didn’t for us! I hope it helps some of you. #1: DVD & Movies: What kid doesn’t like movies in the car? But Gabe was barely 11 months, so at first this didn’t occur to me. Then I realized that he LOVES his Baby Einstein DVDS so we took his favorite one plus a couple new ones and used the portable DVD player to keep him occupied. #2: New Toys to Open: I saw this wonderful blog post about how this lady bought simple dollar store toys that her child had never seen and wrapped them. Then every couple hours he got to unwrap a new toy. My 11 year old daughter spent time wrapping all these toys so Gabe could have fun opening them. We figured that he’d spend time having fun just with the unwrapping….not the case. He didn’t care about the wrapping and we had to unwrap them for him. But…the toys were almost all a hit. A few of his favorite things were a bag of small plastic snakes, plastic slinky, pinwheel, and clapper hands. 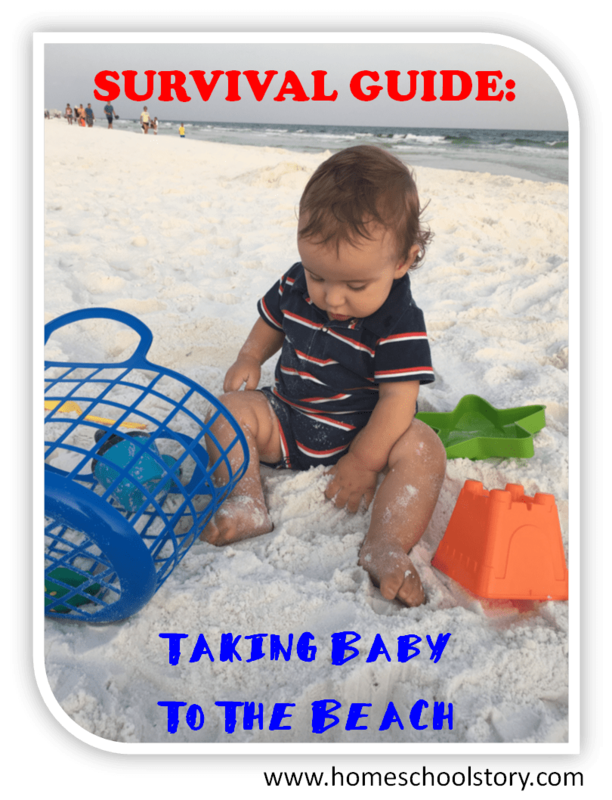 There were several Pinterest ideas for having fun with your baby or toddler at the beach. We put a few of them to use! 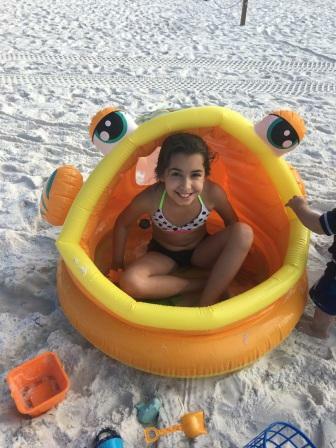 #1 : Kiddie Pool on the Sand: This idea was great. Bring the water to you… away from the waters edge and shallow enough to be safe. Baby can play, get cooled off, and be right next to you. We purchased this amazing kiddie pool from Amazon. It was so cute and although I was worried that it would be too small, it was the perfect size. It offered some shade too. The bottom is also inflatable and makes like a quilted pattern so it offers cushion as well. We filled it with a few buckets of water just enough to be enough for splashing. Gabe loved climbing in and out and throwing his sand toys into it. We didn’t use it every day, but I would still highly recommend it. I had seen other ideas like digging a hole and lining it with a plastic shower curtain then filling up with water, but honestly I liked the actual pool better. Plus I have already used it at home. I also read on the reviews that it makes a great ball pit which I know my son will love as well! #2 Baby Powder for Sand Removal: This was AMAZING! I really wasn’t sure how this would work, but I thought I’d give it a try! We ALL used it and loved it. Gabe played in the sand all the time, so when it was time for a snack, bottle, or nap, we wanted to get as much sand off him as possible. Washing off in the ocean water only leaves you feeling salty and hosing off just leaves you wet! The baby powder was like MAGIC. Sprinkle on and rub off and BAM…your skin is free of all sand/salt and feels clean and smooth! It was great for diaper changes too since that salt and sand likes to get in all those little creases! #3: Wagon for Stuff and Naps: We purchased this amazing wagon at Costco several years ago to use for our homeschool supplies when I go to our Classical Conversations group each week. I’ve also used it for parks, pools, etc. It worked great to not only transport all our beach supplies from the condo to the beach each day, but I would line it with a fluffy towel and use it as a portable baby bed! Gabe napped in the wagon everyday! 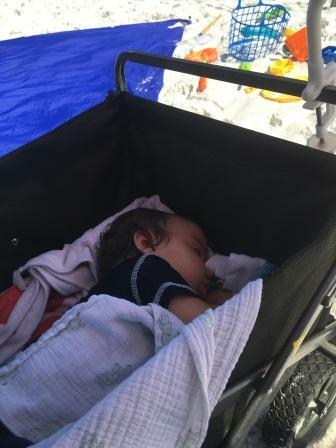 We rolled him under our shade tent and he slept wonderfully listening to the sound of the waves! It also folds up so it’s great for travel. Comfy and Cozy for Nap! #4 Food Pouches for Snacking on the Beach: Those new squeeze pouches are great for all ages. We loved them because it made it easy to have a quick snack of fruit, yogurt, pudding, etc… without worrying about any sand getting in our food! And with these great silicon toppers, you can keep them from spilling and save for later! #5 Pop-up Shade Tent: We originally purchased this shade tent/canopy for an outdoor birthday party last year, but it’s come in handy on several occasions. We had chairs and umbrellas available to us at the beach (provided by the condo) but we knew we’d want more shade. The pop-up was great! It sets up in just a few minutes (needs 2 people to make it easy and quick), and we LOVED it. We lowered one side against the sun so the shade was right under the canopy. All the kids toys and kiddie pool were kept under it and with the breeze it was like sitting in air-conditioning under there! It was awesome! These were just a few of our favorite things that helped us! 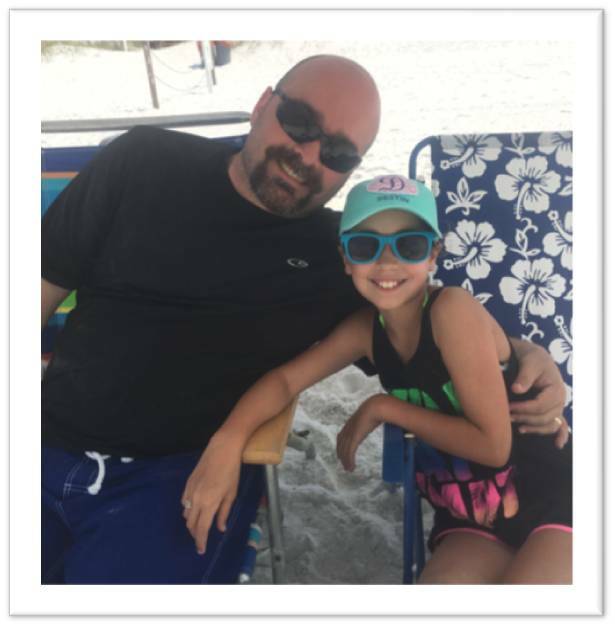 I hope you enjoy your summer and if you have any great tips for traveling, staying at the beach, or any other vacation advice, please comment and share!! *This post contains affiliate links however I was not asked to give reviews or given any items for free in return. These are simply our opinions and links to our favorite items.